Stay at Home Blessings: Earth Day Ideas - What Kids and Adults Can Do? 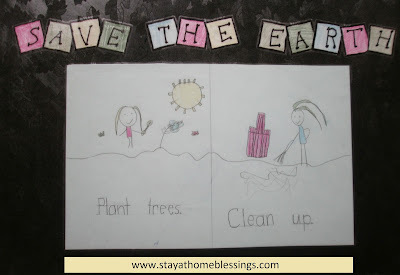 Earth Day Ideas - What Kids and Adults Can Do? April 22 is Earth Day 2012. It's a day dedicated to spreading awareness about taking care of the Earth's environment. It's actually been celebrated since its foundation in 1970 . Watch the video below to have a one-minute overview of the history of Earth Day. So, what can kids and adults do to help take care of our earth? Here's a picture of my 5-year old daughter's project related to Earth Day. She drew the pictures herself. It shows two things we can do to save the earth. We can plant trees. Trees help keep the air clean and helps prevent floods. Clean up. We should know how to dispose of trash properly. It really helps to segregate trash and not to throw them in places where it will cause pollution i.e. in rivers. Save in the use of energy. Turn off lights, TV, etc when not in use. Use LED lights if possible (It reduces power consumption and lowers electric bills). It helps lessen carbon emission. Reuse and Recycle. It's not only a good way of saving resources but it's a good way of making something useful out of something that's considered junk. I wrote a hub related to recycling entitled How to Make Storage Containers Using Recycled Materials which you may want to read. Go green when shopping. Use green, reusable bags instead of plastic bags. These should be practiced not only during earth day but throughout the year. Kids should also be taught while they're still young to take care of the environment. Here are some pages online where you can find lesson plans on earth day including activities, arts, crafts and printables. Lesson Plans Page Earth Day Lesson Plans presents a very exhaustive list of lesson plans revolving around the topic of earth day for kids from K-12. It's a perfect guide for parents homeschooling their kids. A-Z Teacher Stuff Earth Day Activities is a site where you can find some more arts, crafts and printables for kids. I hope we can help save our earth. It's the only world we have. As to saving the earth, freelancers are already doing their part -- by working online and typing words instead of printing paper. Have a lovely summer. Are you back in the Philippines? Thanks for sharing, I do appreciate your point of view by the way I am a pastor at convent church MD. Our church is looking for web based church management software . So we can be in touch in our people anywhere, anytime. I got to know about two companies which are the best, ACS Technologies & Congregation Builder. Both are good at services but Congregation builder is cheaper than ACS tech. So any feedback about them is greatly appreciated.